Amateur Radio is a radio service regulated, in the U.S.A., by the Federal Communication Commission. Licensed Amateur Radio Operators, commonly known as Hams, can use radio waves for a wide variety of purposes. Most commonly, Hams talk to each other over radio using voice (radiotelephone), Morse code (radiotelegraph, or CW) and computer (digital) communication. This communication can be local, regional, or world-wide. There are about 300,000 Ham operators in the U.S.A., and about 150,000 in the rest of the world. Hams often talk about the weather, how their day went, the strength of the other station's signal, and technical things such as transmitters, receivers, and antennas. Hams are licensed in the only radio service where modification of transmitters and antennas is permitted, even encouraged, so it is a great hobby for electronics experimenters. Amateur Radio may not be used for broadcasting or transmission of music, or for business communication. During disasters, Ham Radio may be the only communication service still operating, with telephone lines cut, AC power cut off, and no Internet service. Hams are well-known for their selfless dedication in such times. As an example, after the 2017 Puerto Rico hurricane disaster, 50 Hams went to Puerto Rico to augment the Puerto Rican Hams who were assisting the Red Cross with emergency communications. Why Do You Need A License? To use the Amateur Radio frequency bands you must be licensed. The government requires licensing so that you will know how to be safe when for working with the high voltages of some radio transmitters, so that you know the rules for emergency communications, so you can minimize interference with other radio stations, and so that you can operate your station efficiently. Examinations are conducted by special Radio Amateurs known as Volunteer Examiners, VEs. There are 3 license classes. Technician, General, and Extra. The Technician license is the entry-level license. As a technician you can communicate locally and regionally on VHF (very high frequency) and UHF (ultra high frequency) bands, and worldwide using CW on HF (high frequency, or short wave) bands. The General and the Extra classes permit operation on all Amateur Radio Bands. Full access to the HF bands affords world-wide communication in all modes (radiotelephone, CW, and digital). This generally requires larger antennas and more-elaborate equipment. What Is VHF/UHF vs. HF? VHF (30 MHz to 300MHz) and UHF (300 MHz to 3000MHz) are used for local and sometimes regional communication. These radios often cost less than HF Radios (or rigs) and are easily set up. However, range is normally limited to the horizon or slightly beyond it. If you have had experience with GMRS/FRS Radios (Walkie-Talkies), which operate in the UHF spectrum, you have had experience with the limited range of UHF communication. However, with an Amateur Radio License you can utilize 100 times the power of the standard GMRS/FRS walkie-talkie, and can communicate at several times the distance. Many Ham Radio Clubs, including BCARA, maintain repeaters, which enable high-quality communication between VHF stations as far as 100 miles apart. 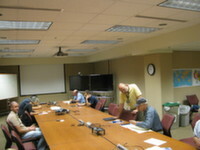 The BCARA VE Team holds Amateur Radio Exams Sessions at the Boy Scout Center, 850 Morton Avenue Extension. There are exams for Technician, General and Extra Class. Exams are multiple choice. For many years, Amateur examinations included a Morse code exam. Morse proficiency is no longer required, and there is no Morse exam component. There are no age or citizenship requirements: if you can pass the test, you can get a license. Information about the subject matter of F.C.C. Amateur Radio exams can be obtained from the American Radio Relay League. Exam fee is $15.00 per session (retests are considered a new session). The Exam Team will schedule special sessions upon request as needed. Reservations are required for all sessions. For additional information contact Dave, AA3YW@arrl.net or by phone at 724.282.6777.